What's fair? Race, bullying and difficult choices are all addressed in these picture books about fairness for children from Kindergarten to Grade 3. 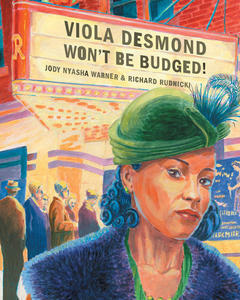 Readers as young as kindergarten can feel the injustice in Viola Desmond Won't Be Budged! Jody Nyasha Warner's simple, powerful language and Richard Ruknicki's colourful pictures portray an ordinary woman doing a remarkable thing: fighting for what's right. In 1946, Viola's car broke down in Nova Scotia. While her car was getting fixed, she went to the movies, where she was asked to sit in the balcony with other black people. When Viola bravely refused, the manager called the police and she was taken to jail and fined for not paying the proper ticket price, even though she'd offered to do so in the theatre. There's a useful postscript which gives some background about Viola's life. 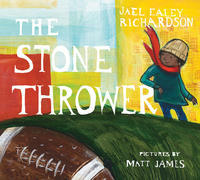 The concept of equity also comes up in the postscript of The Stone Thrower, by Jael Ealey Richardson, illustrated by Matt James. Chuck Ealey (the author's father) was the victim of circumstance. Having grown up poor during the 60s, Chuck turned out to be an extraordinary quarterback, shut out of the NFL for being black. He moved to Canada and there became a successful CFL player. The book portrays Chuck's childhood and how he overcame the adversity of growing up in poverty, living (literally) on the wrong side of the tracks. Chuck uses the moving locomotives as target practice; his stone-throwing skills become the ticket to a better life. 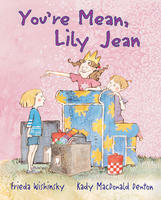 In Frieda Wishinksy's You're Mean, Lily Jean, illustrated by Kady MacDonald Denton, the main character, Carly stands up to injustice. When bossy Lily Jean moves in next door and starts playing with Carly's older sister, Carly is excluded unless she agrees to submit to Lily Jean’s humiliating demands, such as eating grass like a cow, or pretending to be a dog. When Carly exacts her revenge by stealing Lily's shoe, just like a dog would, this bold act turns everything around, forcing Lily and her sister to play fair. 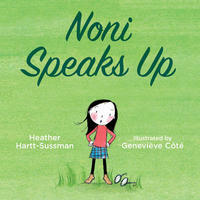 Courage is also what's required in Noni Speaks Up, by Heather Hartt-Sussman, illustrated by Genevieve Cote. This tale (one in a series of Noni books) tells the story of Noni, a bystander to bullying. Peer pressure prevents Noni from saying anything, but when the bully's target, Hector, is pushed off a swing, Noni finally finds a way to stand up to the wrongdoing. 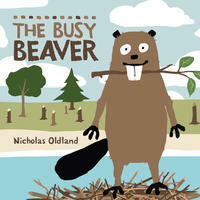 The main character in The Busy Beaver, by Nicholas Oldland, is oblivious to his culpability. Beaver is a careless creature whose actions injure others. He knocks down trees, displaces birds, injures forest friends. Then one day, Beaver himself gets clocked by a tree; during his rehab, he realizes how to make things right.